Yes, this is really me. I thought it was best to publish the photos immediately before some savvy blackmail artist tried to extort funds from me. As a surprise, my host mother brought me to her friend’s kimono shop in Morioka. (Mom—I know you’ll chuckle knowing my tomboy childhood and my preferring to play baseball over dressing up). I donned a traditional wig to hide my blond locks and the fashion show began. One of the dresses, an exquisite pattern of embroidered flowers, took over three years to complete. 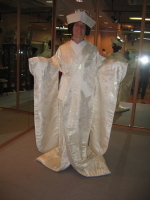 I learned that in a typical Japanese wedding, the bride changes dresses four times: two kimonos and two western style dresses. I have never worn such beautiful clothing, but I still prefer playing catch.